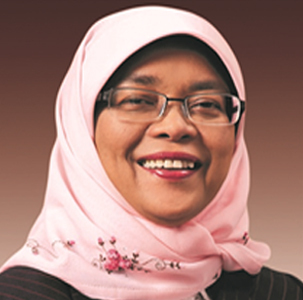 Her Excellency Madam Halimah Yacob was elected as the first woman Speaker of Parliament in January 2013. She has been a Member of Parliament since 2001 serving the Jurong Group Representation Constituency, and then in 2015 in the Marsiling-Yew Tee Group Representation Constituency. She had previously served as Minister of State in the Ministry of Social and Family Development. In 1978, she graduated from the National University of Singapore (NUS) with a Bachelor of Laws (Honours). She was called to the Singapore Bar in 1981. In 2001, she attained a Master of Laws from NUS. In 2016, she was conferred an honorary Doctor of Law Degree by the NUS. In 1978, Madam Halimah started her career with the National Trades Union Congress (NTUC) and has held various positions, including Director of the Singapore Institute of Labour Studies, Director of the Women’s Development Secretariat, Director of the Legal Services Department, and Deputy Secretary General of NTUC. Madam Halimah also sat on various Boards such as the Temasek Cares Board, Housing & Development Board, Economic Development Board, NUS Board of Trustees, Nanyang Polytechnic Board of Governors, Tribunal for Maintenance of Parents and Mendaki Sense. She is also a member of the Governing Body of ILO, the Geneva-based International Labour Organisation. For her commitment in providing women with better opportunities in the workforce, Madam Halimah was awarded the Berita Harian “Achiever of the Year” in 2001, the Her World Magazine’s “Women of the Year” in 2004, the AWARE Heroine Award 2011 and the Singapore Women’s Hall of Fame in 2014.